This a Lent Retreat you can experience on your schedule whenever and wherever you want. We will have daily Facebook posts filled with songs, quotes, devotionals and videos. 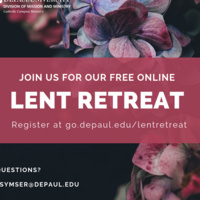 You can also request prayers, spiritual companionship, share your Lenten experience and hear the experiences of other people. Everyone is welcome in this space. Let us support and encourage each other as we experience Lent together.